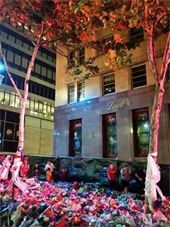 After praying at the Lindt Cafe siege site in Martin Place two days ago, and seeing the strong 11:11 message of peace (‘Lindt Cafe’ adds to 11 in numerology), I felt prompted to speak on radio to spread the message that we are always loved & guided in life. I talked to Spirit, and within hours, received a call to speak on Brisbane’s 4BC radio about surviving the 2004 tsunami. The transcript below is an extract from the show this morning. A big thank you to Chris Adams and Lauren Gillin for this amazing opportunity. This post builds on a previous article, 9 Years and Counting – My Post-Tsunami Psychic Journey. I’d also like to thank writer Jennifer Johnston for her recent assistance and support. It’s not easy for me to talk about this event – the last time I discussed it, I cried for weeks. Even today, I had to lie down after the interview. But as they say – your greatest wound is your life’s teaching. As a scientist who became psychic after the tsunami, I’m proof that miracles happen and that life gives us what we need for growth. Read more on manifesting miracles, here and here. I also write regularly at The Numbers Queen on facebook. Warning for sensitive readers: The following article may contain emotionally distressing content. 4BC Presenter Chris Adams: (after introduction)…One lady Sarah Yip survived the tsunami – she was holidaying in a hotel in Phuket in Thailand when the tsunami hit, and she joins me this morning. Hello Sarah…how do you feel talking about this? Sarah Yip: I’m shaking. It’s still extremely emotional for me to talk about this event. Chris: It’s 10 years…so it’s still that fresh? Sarah: There’s no question, as soon as I go into it, I can see the water and the people and it’s like it’s right in front me of again. It’s very strong for me. Chris: Ok, so take me through the story. Where were you and what happened? Sarah: I had applied to work at the United Nations in Bangkok, so my family and I went for a holiday, we arrived in Phuket on Christmas Eve. We had a choice of whether to go snorkelling on Christmas Day or Boxing Day, and we ended up going on Christmas Day. While we were out there, it was incredibly turbulent, there was a very strange feeling the whole day, and we had a lot of trouble sleeping that night. As a result, the next day we were running a bit late. We actually had an appointment on the beach at 10 o’clock, which is when the tsunami hit. We were supposed to be there at 9.30, we were running quite late and to be honest, it’s just a miracle that I’m even here. As we were getting in the cab, people just started running up the road. I just remember this man screaming and I will never forget it. (It was like) he was melting, he was bright red, he was crying, screaming and he just kept talking about this wave. The thing is, we chose Phuket because we’d done some research – there had never been tsunamis or earthquakes, it was considered very safe. When we saw him, we were like ‘what? Is he drunk…it is the day after Christmas’, this woman next to me actually laughed at him, she thought he was nuts. Chris: (Understanding) Yeah. How far back from the beach were you? Sarah: We were three streets back, approximately one kilometre. People died up to the second street. We wanted beachfront, but it was so busy that Christmas we just could not find a place. Chris: And so did you actually see the water advancing? Sarah: We saw the water come up the street. We didn’t see the water pull out, thank God, because my entire family was there. We saw the water come up the street, we left…the hotel we were in was not damaged but I mean, you could feel it. There were people everywhere, it was crazy. Ambulances, mobile phones went down. It was literally like Armageddon had hit. I hate using cliches but there’s just no way to describe it. Chris: I’ve never seen anything like that, I guess most people haven’t. Sarah: No and I felt…it was just such a coincidence to have been there and to have had that appointment on the beach. It’s like you bumped into Death walking down the street. It was just the most incredible feeling of guilt mixed with relief. Chris: And what happened once the water came up…what happened in the town? Sarah: Um, Thai people in general, this is just my experience having lived there, they’re very controlled, so there was a lot of sense of not trying to show too much emotion or shock. But people (were) everywhere, it was like a war zone, people were camping on the sides of the roads, there were tens of thousands of people everywhere. We fortunately had a car, and our taxi driver didn’t desert us, even though his family thought he was dead. We literally had this Angel with us the whole time. It was chaos, we couldn’t get back to the hotel, we couldn’t fly out because we’d left our passports, it was just a lot of confusion. We didn’t know there had been a tsunami until we saw it on the news a few hours later. I thought it was a flood or something. Chris: So when did you learn the extent of what had happened? Sarah: We went to a bar…I think we were trying to find some food, and we saw it on TV. Even then it didn’t hit me that that’s what had happened. It wasn’t until the next few days we saw the extent of it…I mean, my parents had to hold me back from going down to the water…when we saw it come up, I wanted to go straight down and help. When I was younger, I wanted to be a doctor, it was an incredibly painful experience to watch people suffering and not be able to do anything. But they wouldn’t let me go down. Chris: Ok, so how close did you get to being in real strife, apart from dodging the tsunami because you didn’t go to the appointment. wiped out, no question about it, it was right on the beach…so many people died where we were shopping the day before. So, close enough, that we could have died but I’m fortunate that there wasn’t physical injury.But I can tell you, the trauma has definitely lasted for the full ten years, because we didn’t get counselling (until) about a year later. It was one of those situations where you think ‘it’s not a problem’, but, looking back, it really hits you in your heart. Chris: When you think about it, they say some of the tsunami waves were up to 20 metres high, I mean that’s twice the height of a double storey house. Sarah: Yeah, look I’ve seen the pictures, and I know people who went back and salvaged bodies. I don’t think you can describe it…the pictures don’t even express the feeling. I feel extremely fortunate that we were somehow saved. Chris: What will you do on Boxing Day, by way of ten years on? Sarah: I would like to have been in Thailand but I do a type of spiritual work now, where I work with people on their life purpose, so I’m actually helping people, because a lot of them…there’s just a lot of loss…I’m in Sydney and just visited the (Martin Place/ Lindt Cafe) siege site and there’s just a lot of loss and fear. So I’m still working. That life’s work only came in when I was recovering from the tsunami. Before that I was a scientist. I was a total sceptic of spiritual stuff. Chris: It obviously changed a lot of lives Sarah, including yours. Sarah: Yeah absolutely, it’s just the most incredible, intense experience. Chris: We appreciate you telling us about it and are glad you are ok.
Sarah: Yeah it was definitely a miracle. I feel super grateful to be here. Thank you so much. Chris: Ok Sarah, take care. Emotional trauma is just as real as physical injury…I wish I had gone to counselling straight after Phuket but I didn’t – I waited a year and was practically a zombie by the time I got help. If you are going through a crisis, please, reach out sooner rather than later. Your emotions are better out than in!